We are like a lot of other businesses on Facebook, and while the page has been there quite a while now we’ve only got around to putting a cover on the page today. Since we’ve gone to the trouble of putting together a Wordle containing most of the aspects and areas in which we work, we’ve shared a screenshot here. 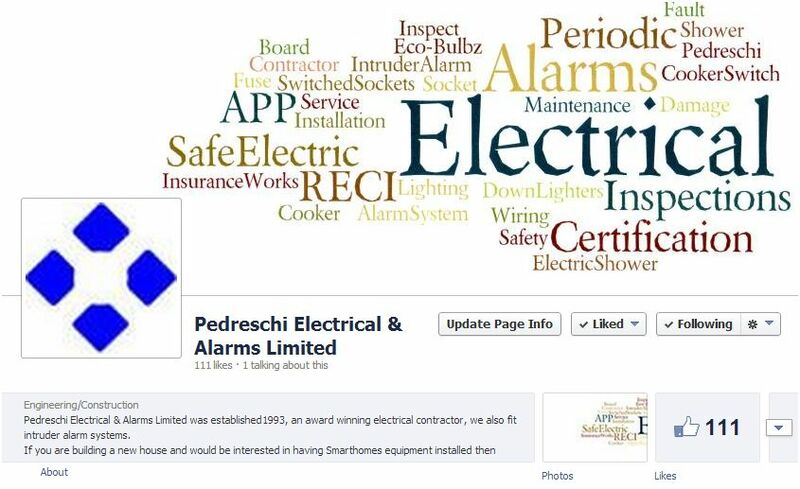 If you are not already a follower then do join us and like our page. 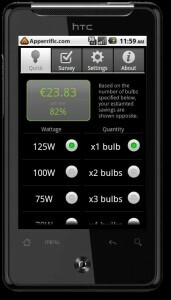 Energy Saving Bulbs, savings made easy with Eco Bulbz App. If you are considering replacing your incandescent light bulbs with energy saving bulbs and would like to know how much money you would save by carrying out this task, then look no further than a great little App, Eco-Bulbz to figure that out. 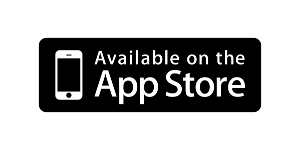 Eco Bulbz is available at both the App Store and the Android Market. The instructions on the app itself are easy to follow. So it’s easy to see the benefits of replacing bulbs for energy saving bulbs as you will see the amount of money saved over a year of use. 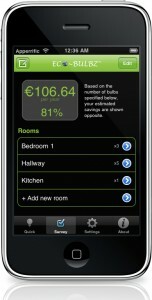 Download the App now and see how much you could save. Download your copy now to see how much money you would save by simply replacing bulbs, plus you will also be saving energy. 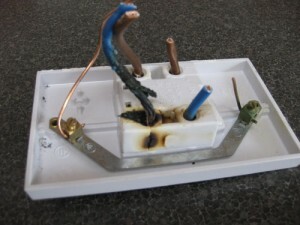 Electrical safety should always be forefront in the mind particularly in the home. 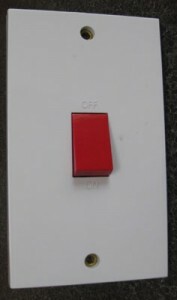 Care should be taken if there is a smell from shower switches, like the one pictured below. If you happen to smell fish from your switch you should discontinue using the shower. Turn the switch off and call a qualified electrician to check out the wiring and the switch. 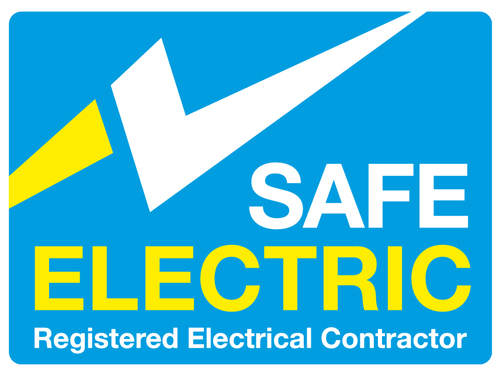 Your electrical contractor should be qualified, insured and included on the Safe Electric register. While we have many items and systems checked and serviced like our heating boiler or intruder alarm system, we very rarely have a vital part of our home given an annual inspection. The vital part I refer to is the wiring and fuse board/consumer board. Over time the installation deteriorates, the insulation becomes brittle and often falls away from the copper within the cabling, this causes arcing and in trun may lead to a fire. Having the electrics tested and inspected will give you piece of mind that your installation is up to current standards and is safe. 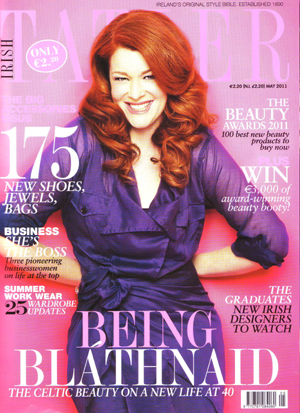 We held a competition recently during the National Enterprise Week which was run by the Bank Of Ireland. We are delighted to announce the winner of this competition is I.McCrean of Castleknock, the prize of a €50 voucher for the Blanchardstown Centre is on its way to you. We were delighted to present our business to the customers of the Bank Of Ireland Blanchardstown branch during the recently held National Enterprise Week. 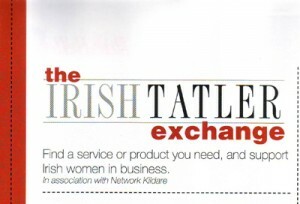 The initiative is a great way for business to have a showcase in what can only be described as a very busy space. There were also a number of events hosted by Bank Of Ireland throughout the country with some very enthusiastic speakers from a variety of backgrounds, be it business or academic. A considerable amount of work was put into the organization of such a countrywide event and we wish to acknowledge this fact and say a very big Thank You to each member of staff who were involved. 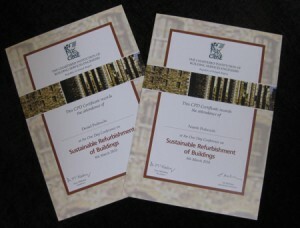 We attended the CIBSE conference recently which was held at the Clontarf Castle. It was a very informative day with good speakers from a range of backgrounds and areas both based in Ireland and other parts of Europe, all of which added different aspects to the topics covered on the day. The event was opened by Minister Eamon Ryan.